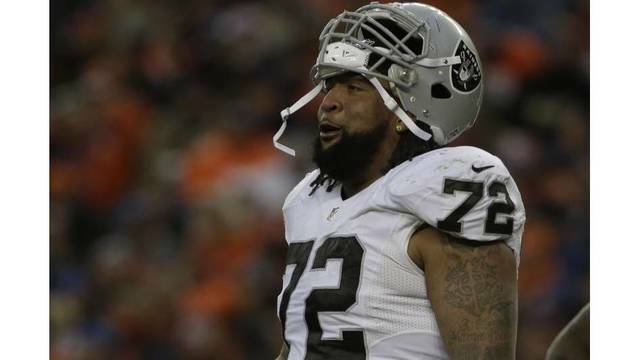 OAKLAND (AP) - The Oakland Raiders have released offensive lineman Donald Penn. The Raiders said Saturday that the two sides came to a mutual decision to let Penn go. The move comes after Oakland signed Trent Brown to the richest contract ever for a tackle earlier in the week and drafted two tackles in the first three rounds last year. The 35-year-old Penn made two Pro Bowls in five seasons with Oakland and was one of the team's leaders on offense. But he dealt with injuries the past two seasons and became expendable with the addition this week of Brown. Penn shared a message to his fans and the Raiders franchise on Twitter saying, "Once a Raider, always a Raider." Kolton Miller is expected to start at the other tackle spot after being drafted in the first round last year, and 2018 third-round pick Brandon Parker will likely be the backup at both spots.